Debut folk music adventure game Nishan Shaman now available for free on the App Store. Backed by NEXT Studio and Tencent Games to support innovative titles and minority cultures, the game is completely free of ads and in-game purchases with the purpose of trying to promote Chinese culture in a fun and interesting way. 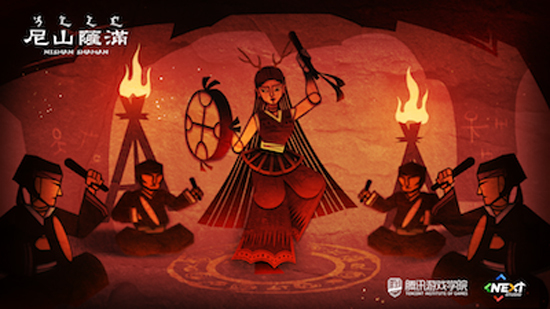 Featuring the traditional paper cutting art style and dramatic shamanistic music, Nishan Shaman is based on an ancient Manchu folk tale combining rhythmic game mechanics with musical storytelling. The game is heavily inspired by The Tale of the Nishan Shaman, the one great surviving text of Manchu literature, where a female shaman resurrects the son of a rich landowner. The uplifting and challenging gameplay of Nishan Shaman revolves around a system unique to the musical game genre: a semi-circular area of influence around the titular character which must be tapped and pressed in time with the beat in order to ward off the demons of the underworld. Nominated for the Best Sound award at Casual Connect London 2018, the game features five background folk music tracks created by a student from Shanghai Conservatory of Music. Nishan Shaman is available in 12 languages, including English, French, Spanish, German, Russian and others.